﻿ The page of Panzer Strategy in Steam now! 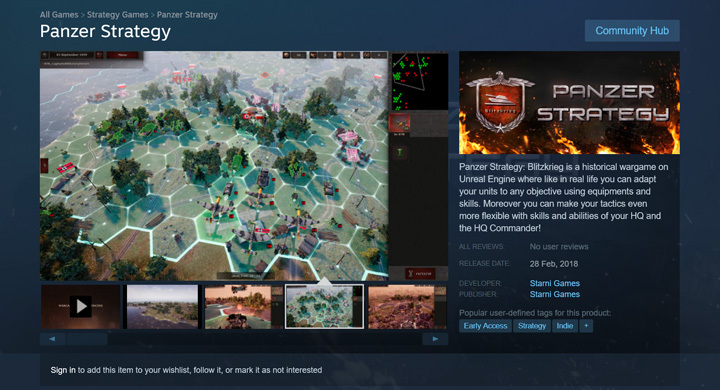 The page of Panzer Strategy is created in Steam! You may add the game to a wishlist, subscribe to updating, review news. Watch the art, add the game to the wishlist! What are the differences of a complete version? First of all, these are 18 maps including “Battle of Britain” , “Siege of Tobruk”, “Plan Blau”, “Operation Citadel” and the others. Naval operations, the full range of headquarters capability and some kinds of content, missing in the version of early access, will be available as well. Put questions and make comment! We will gratefully receive all the remarks from the members of the community as to the aspects of the game: from authenticity of the appearance of the units to game balance. Let’s co-operate together in improving Panzer Strategy!